"The Police Cycle Training Doctrine" is a 93 page instruction manual, produced by 'well-meaning officers' in the UK. Basically, 93 pages - in two volumes! - about how to ride a bicycle. Needless to say, the British press are having a field day. The Daily Mail's article is titled: Police officers get 93-page guide ... on how to ride a bike (and it cost thousands of pounds to produce) and The Guardian has its Police beat off criticism about 93-page manual on how to ride a bike article. The Sun is ... well... rather 'Sunnish' by writing, "The bonkers bike book for bobbies"
Taxpayers' Alliance campaign director Mark Wallace said: "This is an absurd waste of police time and thousands of pounds of taxpayers' money. 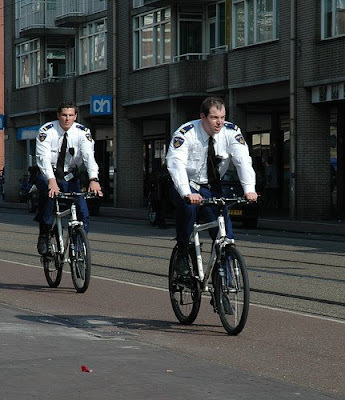 "Police officers are perfectly capable of riding a bike. It's no wonder we haven't enough on the beat if they are having to spend time and energy wading through this nonsense." A Home Office source added: "Most of the red tape the police complain about is actually created by the cops themselves. This is a particularly bad example." Thanks to readers Kevin and Padhraig for the tip.